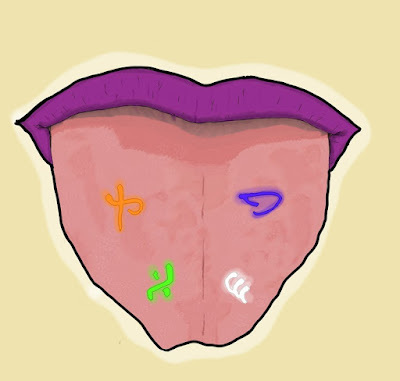 Art Kinda By Me: I used a photograph of my own tongue to create a basic outline. I then add details and color to create a new piece. Since the photograph is of my own tongue, and I gave myself permission to use said photograph, no one is getting cheated out of the money that is due to them. As an aside, I think my tongue might be a bit wide. So this is the first of 3 pics I am making for an upcoming post about words as weapons. The basic gist is that there are bits of Marchen writing that survived the Redaction that occurred after the war. 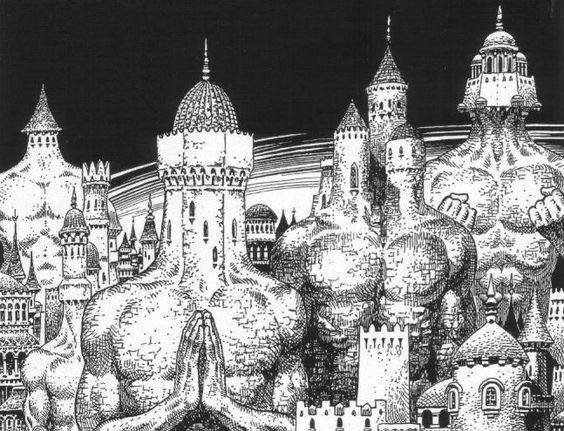 One of the Marchen's main form of technology were words that altered the basic structure of reality itself. They would use said words to make statements, and more importantly, to tell stories that changed the very essence of reality, hence the name Storyteller Wars. By tattooing these surviving words on tongues and palms, the recipients can use said words in an incredibly basic, but destructive, way. The current use is to the Marchen's use as a child just learning their first words are to Cormac McCarthy or China Mieville. I am using symbols from the Voynich manuscript as a basis for the form of writing the Marchen used. Here are the types of tattoos, and the damage they do, they will work similarly to normal weapons though with special damage and to hit variations. If anyone has any suggestions on how to improve this idea, or make it more unique, please let me know.